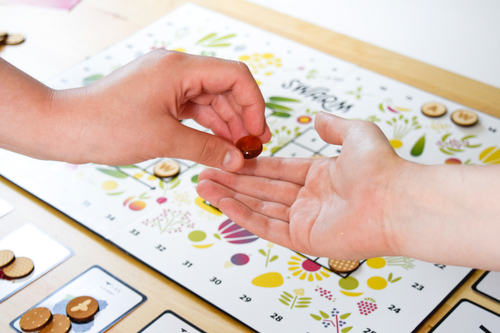 Like A Bee is a series of educational tools dealing with the disappearance of honeybees and their vital connection to our food system. In the past several years, honey bees have been disappearing at an alarming rate. Scientists have not been able to pinpoint the main cause of honey bee death. However, loss of habitat, pollution, pesticides, genetic modification, immunodeficiencies, malnutrition, changes in beekeeping practices, and other human initiated factors are possible and likely causes. Honey bees are incredibly important to our food and our lives. They pollinate the majority of the produce that we eat. If bees completely disappeared, most of our fruit would vanish. Apples, almonds, berries, squash, melons, stone fruit, and more would all be gone within the first year without any bees. Over time, many other plants would not be pollinated and would cease to reproduce. Food prices would skyrocket, food shortages would be commonplace, and our meals would consist of some grains and processed foods. Like A Bee is made up of three sections that address this problem by teaching the audience about the issue, asking them to engage with the cause, and prompting them to take action. These three approaches are titled Work Like A Bee, Swarm Like A Bee, and Sting Like A Bee. How do you get people to care about and invest in a cause? How can graphic design represent sustainability through both its content and physical embodiment? Are there alternative forms of thinking and production that can bring about a more sustainable world? 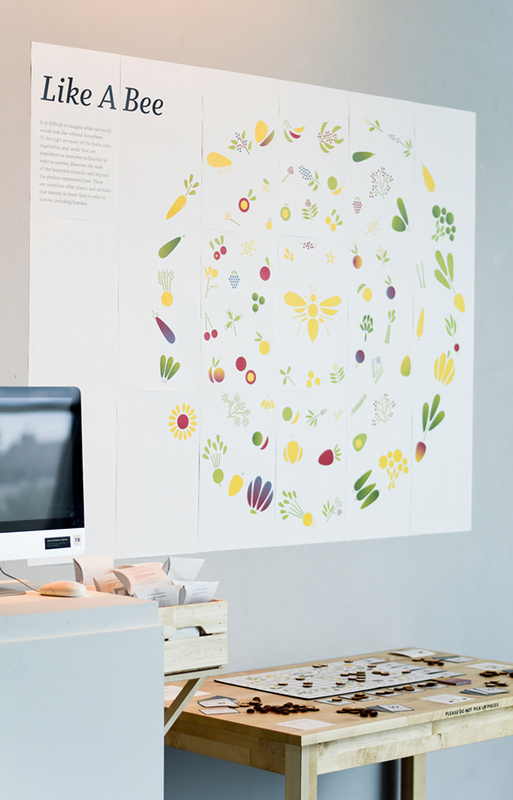 What does designing like a bee look like? How can bee behavior influence how I ask people to think and act? Bees have an incredibly efficient and intuitive system for working that connects so many things. How can we work like a bee to recognize and appreciate their feats? 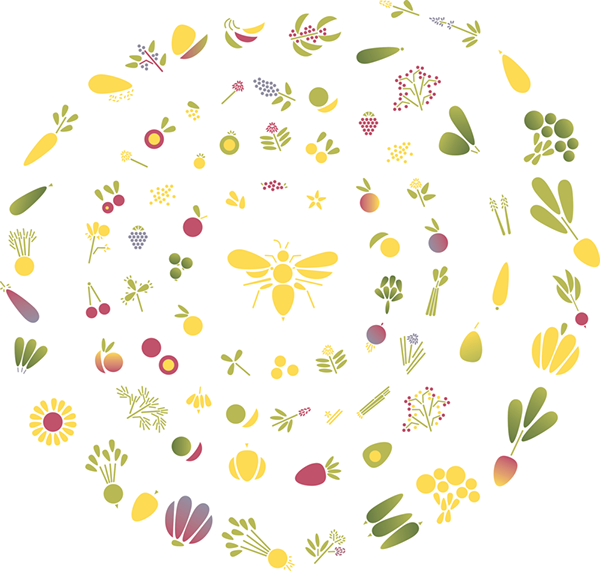 Work Like A Bee is an info graphic that represents how bees are connected to our food system. All icons are made from parts of a stencil cut in the shape of a bee. Similarly to how all honeybees have one grid, one system for making comb, I was going to attempt to use a single stencil to create all of my imagery. 1. Can only use the shapes here. 2. Shapes can be repeated. 3. Shapes can be rotated and flipped. 4. Shapes cannot be scaled. I began to apply the icon system and it worked well for many types of flora, but less so for fauna. The final info graphic represents many, but not all, of the foods and materials that bees provide for us. There are flora in here that are eaten by animals that we eat and so on, so these representations are only the beginnings of the effects of honeybees. I created dyes from natural materials and plants that bees pollinate, with the idea that the stencil I cut could be used with the natural dyes to create all of my imagery. Since the natural dyes fade over time and my exhibition would only be installed for four days, I could let the dyes fade and then easily remove them when they were no longer needed. However, the low viscosity of the dyes and the time it would have taken to hand paint each icon would have made a very laborious and time intensive task. Instead, I created the info graphic digitally and set it up so it could tile print on 11x17 sheets of paper without needing to trim or modify the paper once printed. This solution was fast, inexpensive, and could be easily reproduced by others. Bees are vital to our food and our lives. How can we communicate this to others or help them think about this issue? 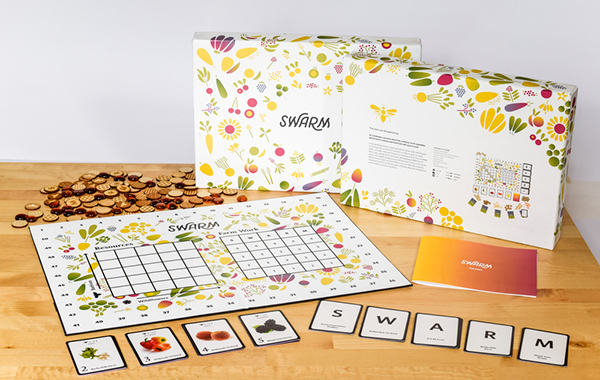 Swarm Like A Bee consists of a strategy game called Swarm. 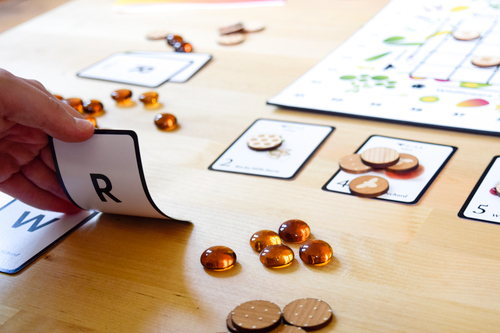 Participants take on the role of a bee keeper, and the goal of the game is to overwhelm the players with different options and choices to simulate what it feels like to deal with the very real problem of CCD. 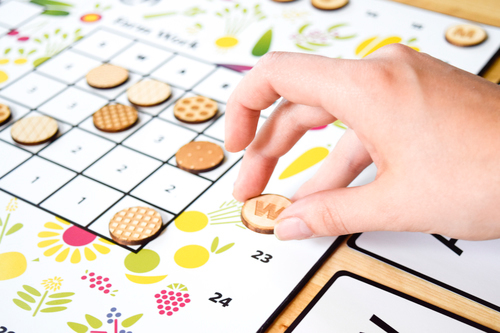 By having participants engage with this issue through game and play, it may be more accessible to someone who has not been introduced to these subjects before. 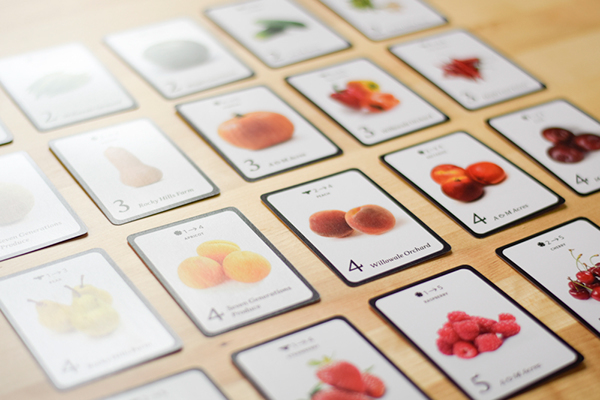 The food I chose to use in the game are fruits and vegetables native to our area that are dependent on honeybees. 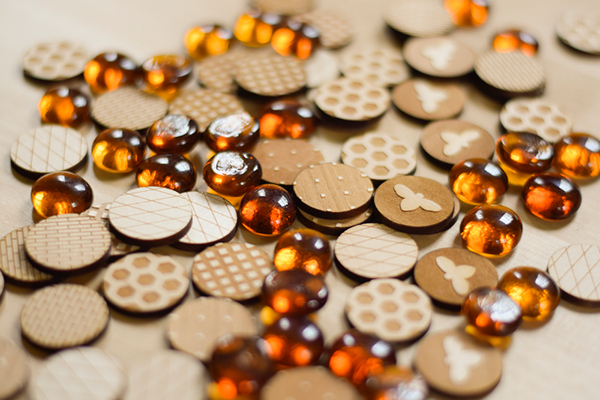 Player counters are laser cut chips whose patterns were derived from the netting that beekeepers wear. The game is playable and I have play tested it a few times. 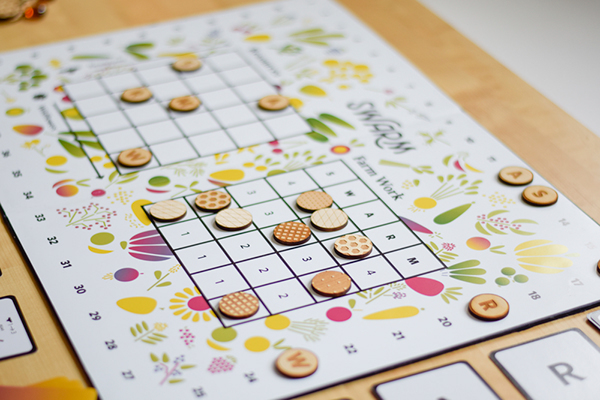 People are frustrated and overwhelmed in the beginning but they eventually get the hang of it, and I think, enjoy it. The world we live in is becoming less and less hospitable to these little creatures. How can we make a better home for them, and for us as well? 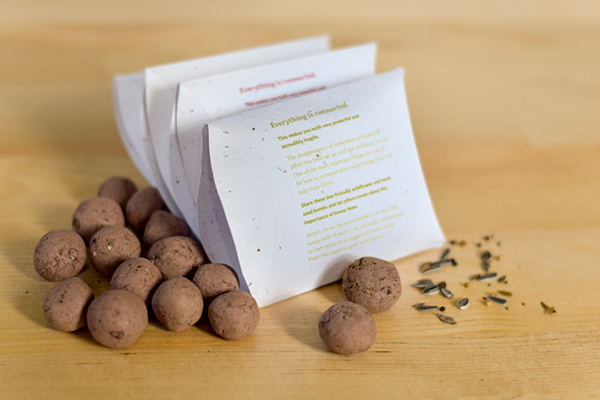 The final piece, Sting Like A Bee, is be a takeaway that includes seed bombs and a message to share with others. Any action, even small, will help these creatures that have such an incredible impact on our food system. Many people fear the sting of a honey bee. Though I do not think people should be fearful of bees, it does go to show how much power something so small contains. 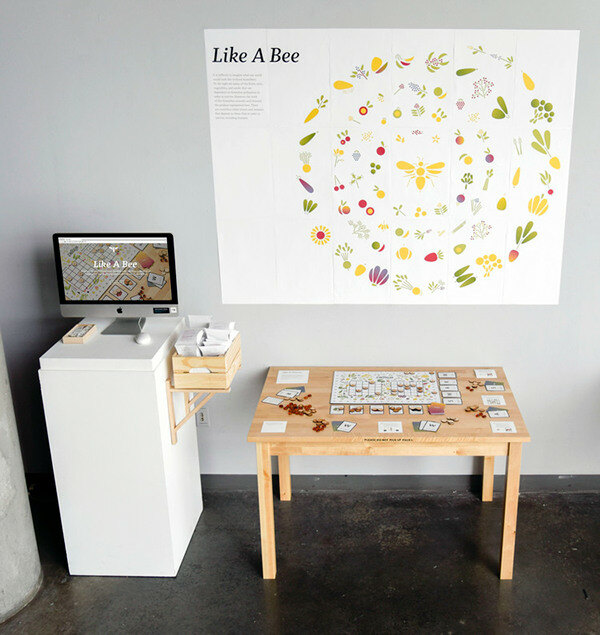 Like A Bee is a series of educational tools dealing with the disappearance of honeybees and their vital connection to our food system. In the past several years, honey bees have been disappearing at an alarming rate. Scientists have not been able to pinpoint the main cause of honey bee death. However, loss of habitat, pollution, pesticides, genetic modification, immunodeficiencies, malnutrition, changes in beekeeping practices, and other human initiated factors are possible and likely causes. Honey bees are incredibly important to our food and our lives. They pollinate the majority of the produce that we eat. If bees completely disappeared, most of our fruit would vanish. Apples, almonds, berries, squash, melons, stone fruit, and more would all be gone within the first year without any bees. Over time, many other plants would not be pollinated and would cease to reproduce. Food prices would skyrocket, food shortages would be commonplace, and our meals would consist of some grains and processed foods. Like A Bee is made up of three sections that address this problem by teaching the audience about the issue, asking them to engage with the cause, and prompting them to take action. These three approaches are titled Work Like A Bee, Swarm Like A Bee, and Sting Like A Bee.